Distinguished by a striking double tiger-head closure, the new Dionysus Bag from Gucci is quickly finding fans across the world. The Dionysus Bag is now available across all Gucci stores in India. A part of the Fall Winter 2015 Collection, the bag has been spotted on the arms of celebrities like Salma Hayek and Korean actor Gianna Jun. Distinguished by the double tiger-head closure, the detail is also the reason behind the bag’s name. The Greek god Dionysus is said to have transformed into a tiger and carried a young nymph across a river, which since then came to be known as Tigris. The design of the Dionysus Bag is inspired from this mythological moment. The Dionysus Bag is available in a variety of materials – suede, python and crocodile – and features the distinct GG Supreme print, a contemporary take on the Gucci G motif. 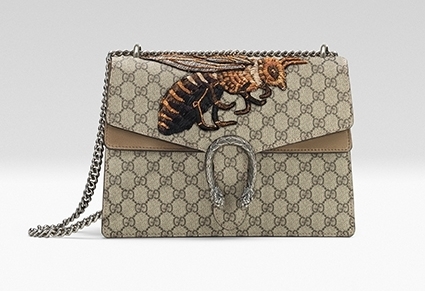 An interesting version is one with a bee hand-embroidered on the bag. It is apparently created using an exclusive technique with thin strips of brass wrapped in silk thread. 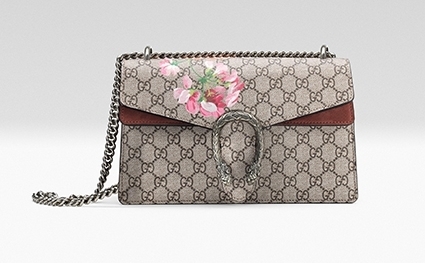 If you would like to bag one of these bags for yourself, locate a Gucci store near you from here. Tagged Accessories, fashion, Gucci, LifeSpice, Luxurious lifestyles, Sartorial Notes. Bookmark the permalink.